Patterns of immigrant settlement as well as the process of incorporation of children of immigrants are directly affecting the life courses of immigrants, their families as well as the majority population in the host country. From this perspective a linkage between the sociology of the life course and research on migration and integration of immigrants seems obvious. 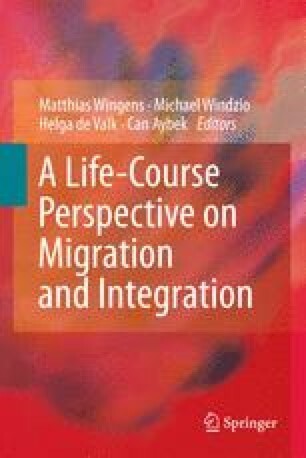 In the general introduction we started with an overview of the theoretical foundations and basic analytical concepts of the life course approach and pointed to potentially fruitful links with migration and integration research. The 11 contributions in this book empirically demonstrated the analytical potential of linking the life course perspective and research on immigrant settlement. In our conclusion the use and payoff of this connection will be discussed in more detail. Now, while the link between the life course approach and migration and integration research seems to be obvious, existing studies on family dynamics and the life course often focus on majority populations only and hardly take those with a migrant origin into account. Little is known on the background and consequences of life course transitions for migrants and their families. Our book is an attempt to overcome this limitation of previous work and to show the relevance of applying a life course approach to the study of immigrant groups. Bridging the gap between research traditions is urgently needed as Europe’s current population is already heterogeneous and expected to be even more diverse in the future. In many countries already a fifth of the population is born abroad, or has at least one parent born outside the country of residence. International migrants often experience a rapid social change when moving from their country of origin to another country of settlement. Depending on the move they may not be familiar with the culture in the country of settlement, its institutional regimes, and everyday life practices. This may bring along many uncertainties as was already very well described by Thomas and Znaniecki in their classic work “The Polish Peasant in Europe and America” (1918–1920). As they also show the migration move can have a disruptive effect on the individual migrant and the family.